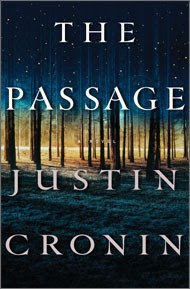 I really enjoyed the story--it was suspenseful and creepy. Way too long, though. I can't believe there are two more whole books coming: on the one hand, like the idea of getting back into this world; on the other, I just think "Ugh. 800 more pages?" 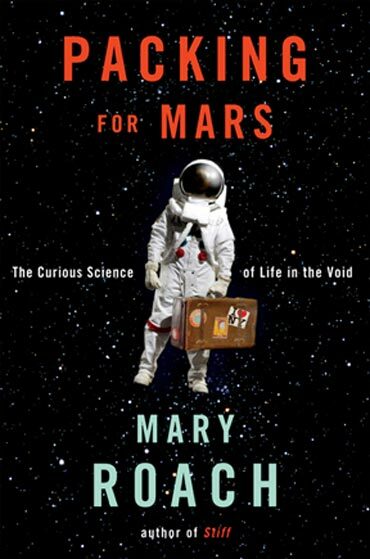 See also the review by Bibliolatry: The long, mostly interesting (but very long) passage. Author/Narrator: Andrew Weil, M.D. Read by the author. You know you've made the big-time as a public health figure when you're known as "Dr. X" (like Dr. Spock)--no first names necessary, thank you very much; it's the inverse, doctorish version of Cher and Madonna, I guess. 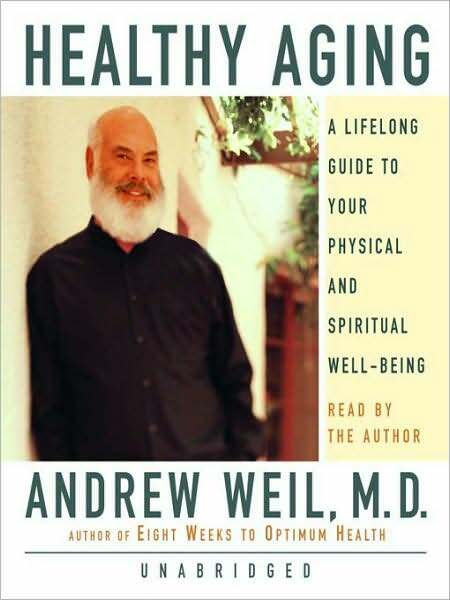 Because Dr. [Andrew] Weil advocates integrative or holistic health, he is perhaps not yet as widely trusted as Dr. Spock was, but I believe that if it is not yet here, that time is coming. The integrative approach to health, as I understand it from reading Weil (and also Alice Domar's books), views health or well-being as the result of one's status in many areas: physical fitness is important, but so are sprituality, nutrition, exercise, and psychology. For Weil specifically (see link to book at end of post), the goal of being healthy/in optimum health is to gird the immune system, to make it as powerful as possible so that the body can fight disease on its own. This is the best, most effective way to heal. Modern medicine can step in when it is needed, but it's better to need it as seldom as possible. Therefore, instead of reflexively reaching for Advil (but doing nothing else) to cure frequent headaches, the integrative approach to health would ask that you instead consider the problem in a wider context--physical, emotional, nutritional, and spiritual--to see if there are ways you can alter your practices in these areas to stave off the headaches to begin with. The goal is to strengthen the body's own defenses overall so the immune system can take care of many problems on its own. I really like the idea of acknoweldging the effects of psychology, spirituality, and interpersonal relationships on health, and it seems logical to focus on strengthening the immune system to forestall problems. In Healthy Aging, Dr. Weil criticizes the excesses/harm caused by the recent antiaging trend (often pseudoscientific) of searching for treatments that deny, reverse, or outright halt the signs of aging; instead, he advocates an integrative approach to growing older that aims at "compressing" morbidity. This basically means living well and then dying fast: having an active old age without significant debilitation until one's last few years (months? ), when the end comes. If suffering and major illness are limited for the most part to the end of the lifespan, then one can experience the positive aspects (wisdom, depth, perspective, reflectiveness, etc.) of growing older without being overwhelmed or immobilized by pain or chronic suffering. In addition to questioning the usefulness of the desire to halt or eradicate aging entirely, Dr. Weil also discusses the positive aspects of growing older, looking at aging as an enriching, deepening process. He considers the aging of whiskey, wine, and cheese as positive examples. Rot and decay are involved in these processes, to be sure, but they can produce positive results, such as enhanced, complex flavor and depth of taste. Weil wants us to view the effects of human aging in similar fashion. Denial of aging is not useful; nor is pretending that one will not die or ignoring the process and effects of bodily decline that we all experience. To live openly and straightforwardly with the process--physically, spiritually, and emotionally--and accept both the gifts it offers and the costs it exacts is ultimately more rewarding, says Dr. Weil. I agree. 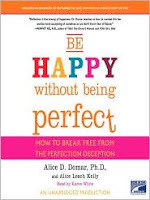 A note on the audiobook: it's read by Dr. Weil himself. When an author reads his/her own work, it's often illuminating in terms of tone, inflection, interpretation. 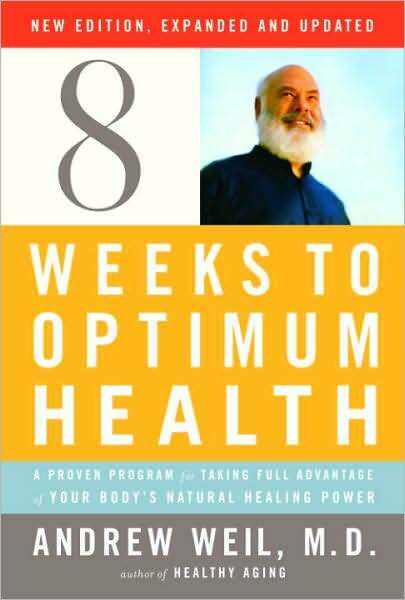 For me, sadly, Dr. Weil was not the most effective narrator of his own book. He reads as if delivering a paper at an academic conference: rather dry, sometimes hurried, distant, and he pounces on "QUOTE" . . . "END QUOTE." At least he does not say "unquote," as some do. His voice can seem flat at times, a bit monotone, though it is possible to tell when his enthusiasm/intensity level raises. I think this text would've been better served by a professional reader, someone more skilled at using tone/modulation/expressiveness to retain reader interest. To listen to Dr. Weil read a URL aloud is a somewhat unpleasant experience. That said, however, no one's beard (see cover pix) is cuter than Dr. Weil's. A final note. It's expensive to be healthy. Organic foods cost more; vitamins can really add up (my own personal vitamin recommendation over at Dr. Weil's site would cost over a hundred dollars a month); and it is time consuming to prepare whole foods. Is this an approach to eating that can be adopted by busy people without much money? Will it appeal to more than the worried wealthy (or merely well-off) well? I hope so. #bookstorebingo on Twitter. If you've ever worked in a bookstore you'll be able to relate. For example, @Watermarkbooks "had a summer-long Jane Austen bookclub. Had someone ask when she would be there." I'm confused by the "cozy" genre of mysteries. I guess they're supposed to make you feel cozy and happy . . . about murder? About not being murdered? Generally, they seem to produce "feel-good" murder stories. At their worst, they tend to kill off threats/scapegoats (not "nice" people) and preserve the strength of the community through the ultimate expulsion. On the positive side, cozies do not intend to glorify violence or crime; they show it as a tragedy and chart the subtle ways murder can affect a community and the psychological dynamics within it. The cozies I've read feature close-knit groups of people who happen to live in places where many murders occur. That's where the genre gets a bit dicey for me. If these are such great places, why do so many people die in them? I am reminded of the TV show Murder, She Wrote. Why weren't people shunning Jessica Fletcher or running like hell from her? Why wasn't she banished from Cabot Cove? Nothing good happened while she was around. In more seriousness, it is a worthwhile project to think about how crime affects a community, and in this, cozies excel. Often, mystery novels forget to trace the longstanding, painful effects of violent crime: how families/friends of victims, suspects, the police, and so forth all cope with the fallout. 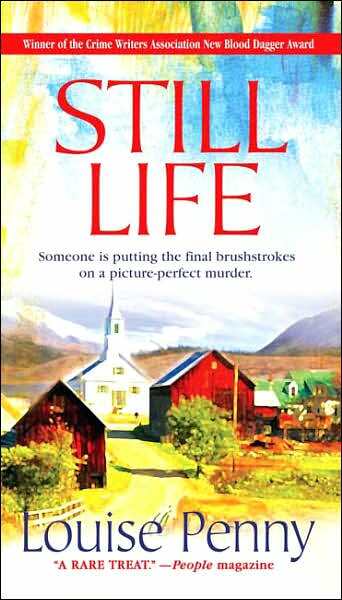 If some of the cozies I've read tend to idealize community ties and affluence, they also provide well-drawn and interesting characters and seem more psychologically astute than the standard plot-driven whodunnit. Louise Penny's Armand Gamache series features a great main character and an interesting community in Quebec. I have learned much about the English/Quebecois relationship in Canada from the two books I've read. Penny is a great plotter and her mysteries have interesting twists and turns. She makes you feel exasperated and fond of her characters on alternating pages, and she does not idealize them. They are flawed and yet still likable. If these books tend toward a certain worship of Gamache, I have to sympathize, because he truly is a great character. Sometimes the denizens of Three Pines are a bit too talented, too progressive, too witty, too sensitive and artistic to be believable, but at the same time, the place seems appealing as well. Gamache is an outsider in a sense to the community, which is an important, useful device because this way readers, like him, can evaluate the positive and negatives in the community. I've found the plots very interesting and engaging; Penny is a good storyteller and does a great job of creating tension. The two books in the Three Pines series I've read, the first and fourth, are very interesting, and I'm going to keep reading the series. 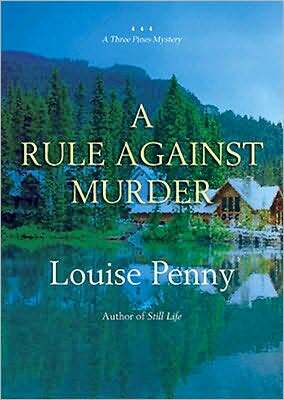 Louise Penny is a great find for me--I love character-driven mysteries, and hers are very engaging. I am a huge fan of James M. Tabor's Forever on the Mountain, which tells of a disastrous mountaineering expedition in 1967 in which only five of twelve men survived an attempt to climb Denali (once known as Mount McKinley). That book gives a brilliant analysis of team dynamics and psychological conflict, and it provide a fascinating meditation on the nature of leadership and varying leadership styles. 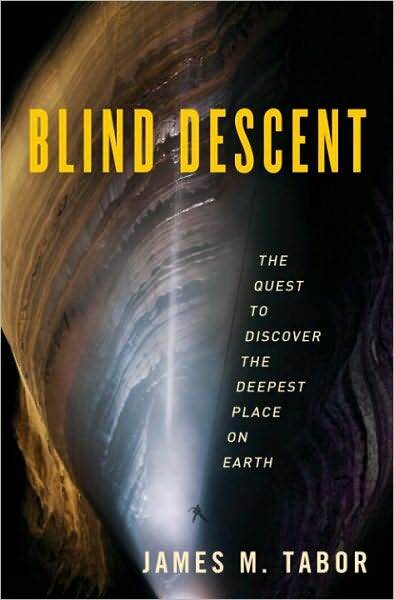 In Blind Descent, Tabor moves from mountaineering to cave diving. The exploration of "super caves" is as dangerous as high-altitude mountaineering but provides unique challenges of its own. This book got me really interested in cave diving, though I know I'd never want to do it. As in his previous book, Tabor has chosen two contrasting leaders/expedition styles to follow. The American leader is Bill Stone; the Ukrainian is Alexander Klimchouk. Stone is fascinatingly flawed, alternately impressive and deeply annoying. Klimchouk comes off as more of a mystery and a private person, but an infinitely better leader, though it's more difficult for Tabor to trace the inner dynamics of K's expeditions because of the language barrier. Blind Descent provides less of a unified narrative because the quests of the two men/expeditions are not precisely parallel; their quests took place at different times, and Klimchouk was not even present physically on the final expedition of his team described in the book. Owing to this structure, the narrative has some difficulty sustaining head-to-head tension, so I do not suggest reading this book primarily to see who wins the "race." That's not its strength, and besides, as I discovered, one of the figure captions tells you anyway who won! I felt that some of what made Forever on the Mountain so unforgettable was Tabor's analysis and comparison: in Blind Descent, I thought Tabor's interpretive voice was less present. I should say, however, that the book is extremely engaging and that I devoured it quickly. The stories are harrowing, and the near-misses and triumphs keep the reader very engaged. If it's less reflective, it's because the text is less an analysis than a primary source report. It should be noted that in Forever on the Mountain, Tabor was dealing with an expedition that took place years ago; that there were already several existing memoirs and interpretations of the event; and that all in all, the Denali expedition lent itself better to an account that focused on analysis. Blind Descent is more firmly located in the here and now, the explorers' present. The book has some great images; unless you've got an e-reader that handles images really nicely, I'd go hard copy with this one. Watch out for the "spoiler" in the figure caption; I kid you not; it tells you right there. This is the book's way, probably, of discouraging readers from reading it primarily as a "race" book. 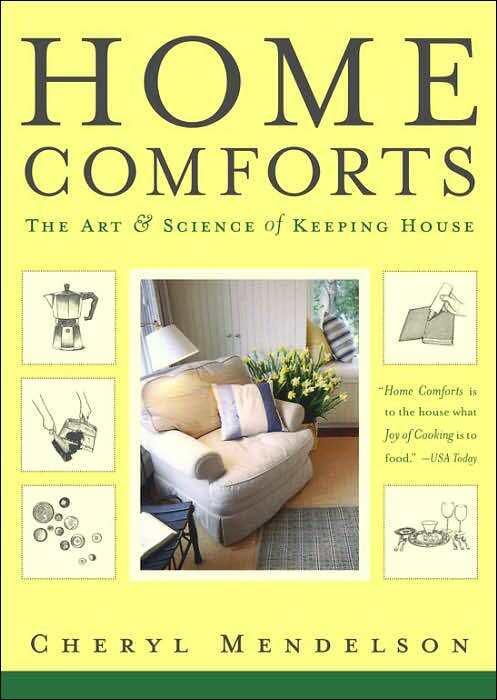 This book contains some of the only descriptions/discussion of housework I've ever encountered that does not make me want to pull my hair out or feel sullen. Seen from the outside, housework can look like a Sisyphean task that gives you no sense of reward or completion. Yet housework actually offers more opportunities for savoring achievement than almost any other work I can think of. Each of its regular routines brings satisfaction when it is completed. These routines echo the rhythm of life, and the housekeeping rhythm is the rhythm of the body. You get satisfaction not only from the sense of order, cleanliness, freshness, peace and plenty restored, but from the knowledge that you yourself and those you care about are going to enjoy these benefits (10). Housekeeping creates cleanliness, order, regularity, beauty, the conditions for health and safety, and a good place to do and feel all the things you wish and need to do and feel in your home. . . . It is your housekeeping that makes your home alive, that turns it into a small society in its own right, a vital place with its own ways and rhythms, the place where you can be more yourself than you can anyplace else (7). This book has sane, smart suggestions on letting go of perfectionism, and lots of great relaxation techniques. --partners benefit equally from [Ed. looks like I wrote "hord" here, but that makes no sense. Oh.] bond. Also really good is Domar's Self Nurture. The only way to heal old wounds that cause us to grasp for love or possessions is to recognize them, grieve for our losses, and nourish ourselves with compassion" (15).